The Mitsubishi/DSM 6G72 engine platform is 3.0L displacement featuring a bore size of 91.1 mm (3.590") and stroke is 76 mm (3.000"). 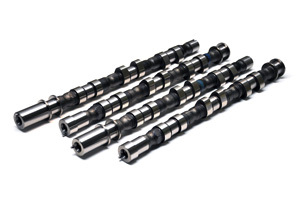 The camshafts listed below are for the DOHC 24-valve version was used in a variety Mitsubishi and Dodge chassis but most notably this engine is found in the Mitsubishi 3000GT and Dodge Stealth vehicle applications. It has a cast iron engine block and aluminum cylinder heads. The DOHC 24-Valve produces 222 horsepower and 205 foot pounds of torque in naturally aspirated form, and as much as 320 horsepower and 315 foot pounds of torque in turbocharged form direct from the factory.